FUGAWI ENC 4.5, is used as chart plotting software. 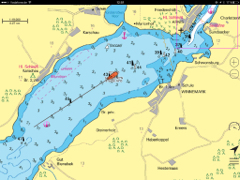 It will run charts supplied by NV-Publishers, MAP-TECH raster charts, Navionics and S57 vector charts beyond others. It allows AIS and GRIB data overlays and links directly to GPS units made by a large variety of manufacturers on the market for exchange of waypoints/routes/tracks. JVCOMM32 for reception of NAVTEX/RTTY/weatherfax transmission by connecting to a NASA HF4 receiver. To set-up and adjust the ACTISENSE NDC-4 Multiplexer a separate software is provided with this unit.